What Is the Italian Attitude Toward Dining Out? 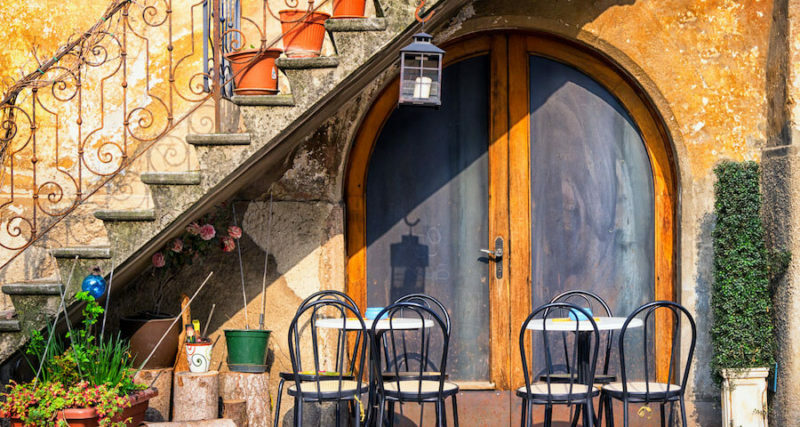 Whether looking to travel through Italy or set up shop for a while, it’s important to note that shopping in Italy is a bit different than what you are used to in other places. Italians generally like to buy all of their food fresh and going to market is an important part of their day-to-day lives. While Italy has certainly embraced the 21st century, there are still some shops that seem to be a throwback to a simpler time. When walking the streets of Italy, you’ll be able to find indoor markets, street markets, and traveling markets. The traveling markets are usually quite a bit cheaper than chain and more popular stores. When it comes to those bigger and more shopped at stores, places like supermarkets are not as populous as they are in North America or Great Britain. Supermarkets only account for about six percent of all grocery shopping in the entire country. Smaller markets, as well as open-air markets, are still quite a bit more popular than any other kind of market. It seems as those the Italian shopper trusts these smaller businesses to the massive chains that are popping up in other parts of the world. When talking about the biggest chains in Italy, you’ll be talking about places like Esselunga, Conad, and Coop. These markets all adhere to the general policy of Italy. This means shoppers tend to take their own bags, as opposed to having them bagged at the store. There is no carry out either. With a country that puts such importance on food as a cultural pillar, it makes sense that the average day of an Italian is structured around mealtimes. For Italians, meals are more about socialization and building community while sharing delicious, homemade foods and perfectly paired wines. The day begins with breakfast (“prima colazione”) around 7:30 a.m., which usually consists of croissants or biscuits paired with milk, tea, or strong coffee. Children enjoy milk with cereals, with a little bit of coffee added. While many other regional cuisines around the world rely on a heavy, protein-packed breakfast to provide enough energy to get through the day, an Italian breakfast is meant to give just a small boost to get the day started. Lunch serves as a main meal of the day for many Italians and often consists of multiple consecutive courses. Lunchtime generally begins between 1:00 p.m. and 2:00 p.m. and starts off with a pasta- or rice-based dish, followed by meat and vegetable courses. On Sundays lunch can last up to three hours with plenty of convivial socialization. Dinner is generally served around 8:00 p.m. but can be as late as 10:00 p.m. as families tend to wait for all family members to arrive home. Dinner is considered a social meal, and when guests are over, the host will generally pour the first round of wine. After that, everyone may serve themselves. Remember to respond with an energetic “Salute!” when the toast is given! One of the biggest reasons thousands of tourists visit Italy each year can be summed up in one word: food! Known for its delectable and diverse cuisine, Italy is the birthplace of hundreds of dishes that have become worldwide favorites, from “spaghetti alla carbonara,” to ultra-thin pizza, to creamy gelato in endless flavors. The only trouble you will have is deciding which local restaurant to try first in this expansive mecca for foodies. No matter what areas you plan to visit, you will be sure to find something to suit your palate. Each region has its own traditions, preferred ingredients, and tried-and-true methods. In the south, you will find many filling pasta dishes prepared with olive oil and hot red pepper. The north favors black pepper to season, butter for the fat, and rice for the starch. Tuscany offers an earthier menu, with dishes ranging from wild boar sausage to wild-caught hare. For a more exquisite experience, head to Piedmont where truffles shaved over risotto are celebrated. In a country with upwards of 2,000 different pasta shapes and over 4,000 distinct wine labels, it’s no wonder Italy is considered a food capital of the world. To get the most bang for your buck, book your trip around a few food festivals, called “sagre.” At these events, visitors can sample a variety of dishes and wines while socializing with locals and absorbing the culture. Keep an eye out for the Italian State Tourist Office (ENIT)’s yearly booklet, An Italian Year. An appetizer (“aperitivo”) is served first, which usually consists of small nibbles like olives, nuts, or crisps alongside wine or prosecco. This may be followed by a starter (“antipasto”) which will contain sliced meats, like Parma ham or salami, and cheeses or vegetables. Next on the menu is the first main dish (“primo”). This dish will be either pasta, rice, or soup. Common dishes are “risotto,” “gnocchi,” and “ravioli.” The second main course (“secondo”) usually consists of meat or fish. A vegetable side dish (“contorno”) is presented alongside the “secondo” and serves as a palate cleanser. The meal ends with a final course of fruit (“frutta”) followed by a dessert (“dolce”). Italians generally conclude a meal with coffee. Wine is often served throughout the whole meal, no matter the time of day. If you are more of a water drinker, options typically include sparkling or still mineral water (“acqua minerale gassata,” “frizzante”, or “acqua minerale liscia”).